When tackling cleaning jobs that involve dirt, grime, mud, mold, and other forms of filth, pressure washers are bound to take a beating. Therefore, it is important to learn some pressure washer tips that will help you prolong the life of your pressure washer. If you want your pressure washer to serve you for several more years, you need to follow the pressure washer maintenance tips outlined in this guide. We look at some of the maintenance routines you need to complete before and after using your pressure washer as well as how to store it for long periods such as during the winter. Examine the tires. For pneumatic tires, their ideal air pressure is about 15 and 25 PSI so ensure they are filled up. Next, ensure the water inlet screen is not clogged or damaged. It is located near where the garden hose goes and helps filter out debris and impurities. If clogged, flush with it with clean water and if damaged, replace it. Repeat step two with all connectors and accessories. Clogged outlets lead to a build up of pressure within the pressure washer and may cause damage. Inspect the high-pressure hose and ensure that it is not damaged or leaking. Next, check whether the detergent setup is clogged with residual detergent. If so, flush it with clean water. 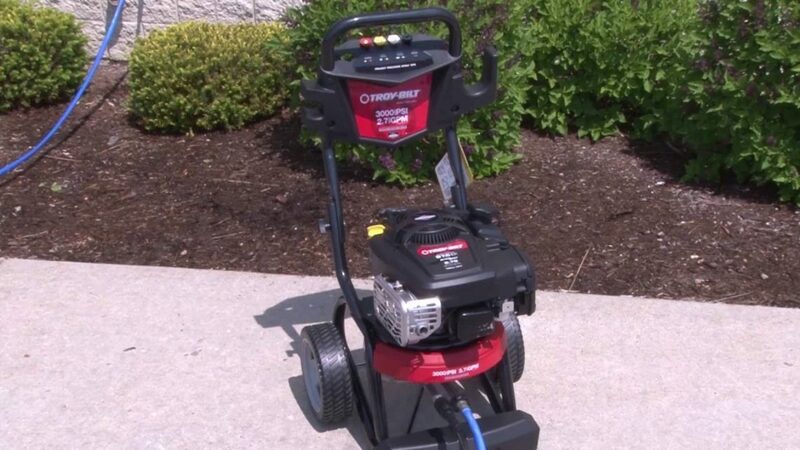 For gas-powered pressure washers, inspect the oil and fuel levels. Refill the fuel tank if it’s low and replace old engine oil as per the instruction manual. Next, make sure the O-rings are in good condition. They are located in the spray wand. If dirty, clean them and replace them if damaged to prevent water leaks. Ensure all connections are secure. This includes the spray gun, the spray tips, and the high-pressure hose. Lastly, flush the garden hose of any impurities and debris before connecting it to the washer. Please read & Follow the instruction manual carefully before using a pressure washer. This ensures safety to operator and the machine itself. When off, take out the detergent system. Store the remaining detergent in another container and then flush it with water. Next, flush the detergent injection tubes thoroughly with water to remove any residue detergent to prevent clogging in the tubes. Turn off the water supply and drain the water in the pressure washer by pressing the spray trigger until all water is discharged. If water is left in the washer, it will form a breeding ground for flies, insects, bacteria and mold. Disconnect all the connectors and accessories. Lastly, find a suitable place to store the washer and its accessories. The location should be secure, away from kids play area and protected from environmental factors such as direct sunlight, rain, and snow. Lubricating all the inter-connecting pieces. This includes the spray gun, extension wand, and the high-pressure hose. Lubrication protects the connection points of these items from wear and tear of as a result of friction. Inspect the cooling vents of your washer and get rid of any debris that might be lodged in the vents for better ventilation and air circulation within your washer. When pressure washing, the impact of water lodges dirt in the vents thereby blocking air circulation. Cleaning the spray tips and quick-connect nozzles to eliminate debris that may hinder the water outflow. Inspecting for damaged O-rings in the water inlet and outlet connection points and replacing them to make your washer both air and water-tight. Installing new O-rings will prevent water from leaking and hence produce maximum pressure. Examine the muffler on your gas-powered washer to ensure that nothing is blocking the discharge of exhaust fumes. For electric-powered washers, ensure the machine is well-insulated and that its spark arrestor is functioning properly to prevent short-circuits. If you find your pressure washer is not functioning properly, please do not attempt yourself for repairing unless you found the problem. There are some minor problems which can be repaired without any expert guidance. But for major problems claim your warranty or consult the local mechanic near you. Follow the regular maintenance routine after using the pressure washer, then continue with step two below. 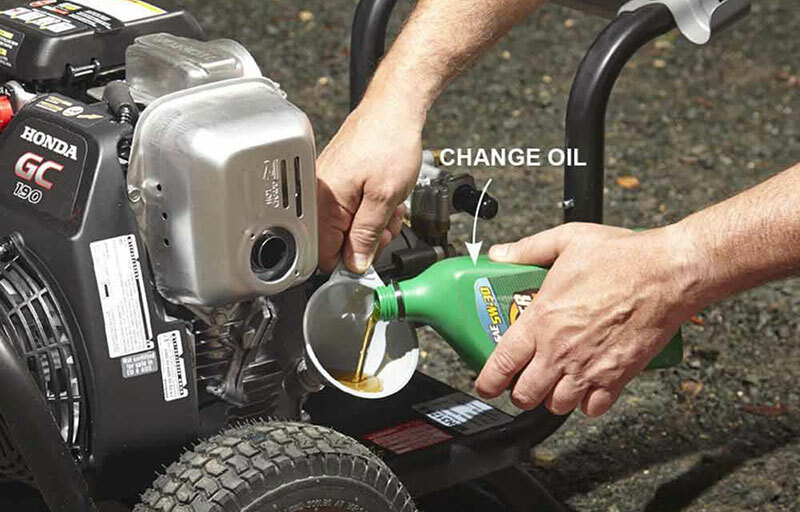 If you own a gas-powered pressure washer, drain the gas or treat it with a fuel stabilizer to preserve it for months. Next, run the engine until all the fuel is consumed and the engine stalls. Smear the pump, seals, and pistons with antifreeze/lubricant to protect them from corrosion caused by mineral deposits during the winter period. 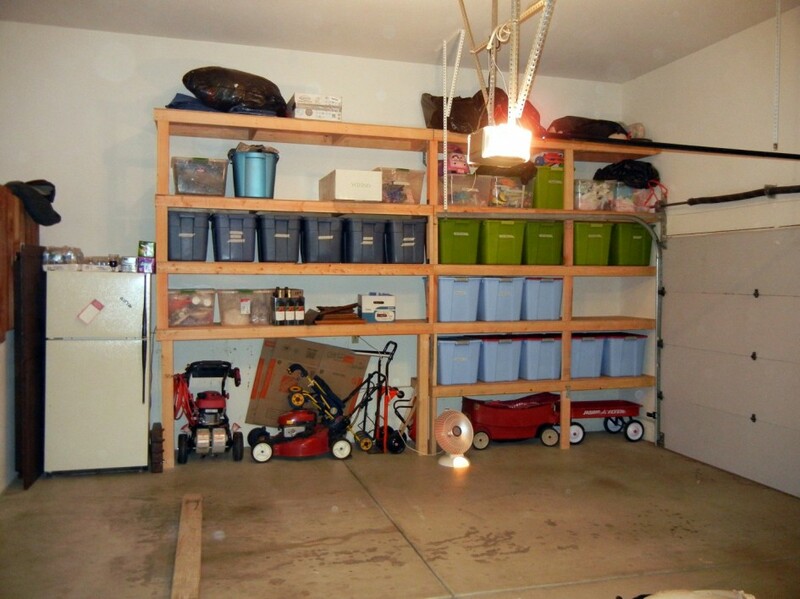 Find a suitable place to store the pressure washer. The ideal location should be far away from a kid’s playground and sheltered from environmental extremes such as strong winds, direct sunlight as well as rain and snow. Round up all the accessories and store them with the pressure washer. Most electric pressure washers come with an inbuilt storage space that allows users to store the washer’s electric cord. As for the high-pressure hose reel, you can round it up neatly and hang it around one of the push handles of the washer for tidy storage. Place a cover on the washer to protect it from things such as moisture, dust, and cobwebs, etc. Please note that if you did not treat or drain the gas in your gas pressure washer, the fuel might be contaminated after a long period. For Long Term Storage of your pressure washer, besides the above stated points, it is mandatory to follow the user manual of your machine. This ensures long term usability without any lag and saves you from repairing hassles. As you can see, some maintenance needs vary between the different power trains of pressure washers. Therefore, always refer to your washer’s instruction manual for specialized maintenance guidelines for your model of pressure washer. That said, upholding good maintenance habits such as cleaning your pressure washer and its accessories before and after every use will go a long way in prolonging your pressure washer’s lifespan. Above stated tips will ensure that the performance levels on your pressure washer remain at peak levels and will keep you from spending money on repairs and spare parts. Thanks for the tips on the importance of inspecting the cooling vents of the washer and getting rid of any debris that might be lodged in the vents for better ventilation and air circulation within the washer. My husband is considering on getting a pressure washer to for cleaning at home. It’s good you mentioned that proper maintenance of pressure washer can prolong its life. Thanks for the tips!